This walk is designed to coincide with the arrival & departure of the train at Birkhill Station. 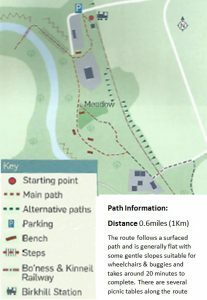 Suitable for wheelchairs and buggies, the walk takes you through the quiet woodland and meadow beside the Avon Gorge & the Boness & Kinneil Railway. Along the walk you will pass through the grounds of the former Birkhill Fireclay Mine Processing Plant, since demolished, you will notice that there are a few information panels about the mine and its workings. If you decide to wait for the next train there are a picnic tables to rest at. Leaflets are available in the station waiting room at Birkhill and also at Bo’ness, if travelling by train and are unsure of the time you have before the train arrives back from Manuel, please check with the guard or Station Master. 1. Follow the signs to the Woodland. This path takes you towards the grounds of the former mine buildings where the fireclay was processed ready for shipment. You will pass a picnic area and a number of information boards. 2. Follow the path as it heads round to your right and you will arrive at the top of the steps that the workers used to reach the old mine workings. 3. The route continues left in a southerly direction along the gorge ridge. Continue along this path until you reach a picnic table. 4. Take the path to your right and follow the loop around the meadow area. There are several places to rest and enjoy the peace & quiet and views of the gorge along this relatively flat route.